Houston won the 1980 National League West title by one game over the Dodgers, and for that one difference-making game, MLB.com’s Opening Day Countdown Down Under turns to that season opener on April 10 inside the Astrodome. J.R. Richard made his fifth consecutive Opening Day start for the Astros, and it was his finest. The 6-foot-8 right-hander struck out 13 and allowed just two hits — a single by Rudy Law and double by Reggie Smith, back-to-back in the seventh inning — over eight innings. Joe Sambito closed it, the game was over in 2:03, and a big year in Houston was under way. At that point, James Rodney Richard was well on his way toward baseball immortality. He would dial up triple digits, at least based on tracking capabilities of the time. Opposing batters stood in fear, and Richard himself would say later that he “could throw a ball through a car wash and it wouldn’t get wet.” Joe Morgan, who played with him and against him, once said he believed Richard would go down as the greatest pitcher of them all. That Opening Day victory would lead to 10 wins in the first half of 1980 and not only his first All-Star selection, but the starting nod that July at Dodger Stadium. Then it all ended. 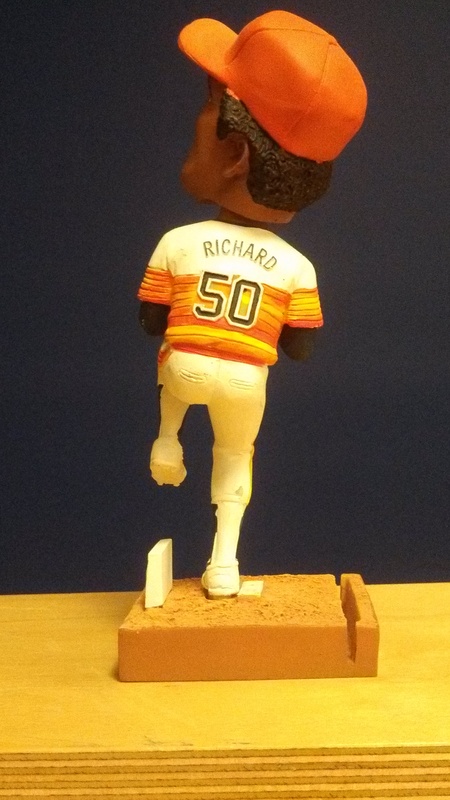 So swiftly, so sadly, leaving the legend of J.R. Richard to share with future generations. Richard knew something was not right in his arm. That July 30, while playing catch before a game, he suffered a stroke and collapsed. Richard was rushed to the hospital for surgery to remove a life-threatening blood clot in his neck, fortunately surviving but never to pitch again in the Majors. Today, at age 63, Richard is a strong presence admired by many, having not only survived that condition but also subsequent financial collapse and homelessness, becoming a Christian minister and helping shape lives. In 2012, when the Astros celebrated their 50th anniversary, they naturally turned to No. 50 to celebrate the occasion, inducting him into their Walk of Fame. For many, it was a chance to close your eyes and think back to a rainbow day when big No. 50 took the mound and nearly no-hit the Dodgers.